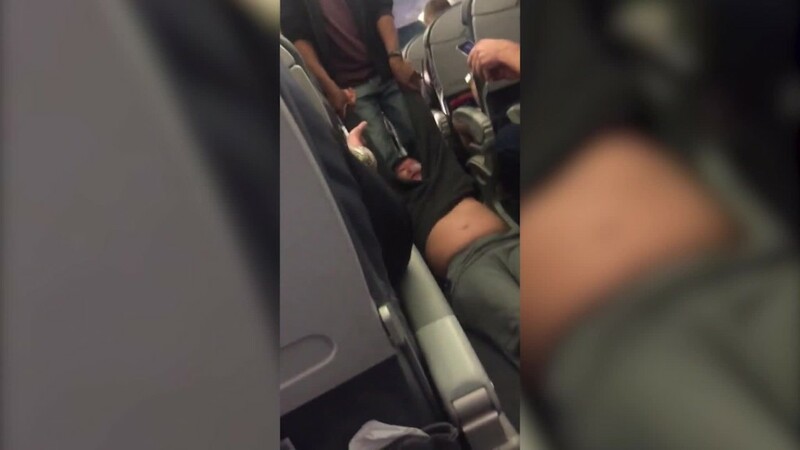 When United Airlines needed extra seats on its plane Sunday night, the airline bumped an unwilling passenger, whom authorities ultimately dragged -- down the aisle -- off the plane. Now, the airline is scrambling to respond to a wave of consternation centered on one question: How can they do that? Part of the problem, at least, comes from the often-overlooked policy that allows airlines to stop passengers from boarding a plane if it's overbooked. You agree to it when you book your tickets. It's standard practice for airlines to sell more tickets than there are seats. Carriers calculate how much wiggle room they have based on past stats that track no-shows and offer passengers vouchers if flights end up too full, and no two airlines have the same approach. "Airlines overbook because people don't show up for flights and they don't want to go with empty seats," said George Hobica, founder of Airfarewatchdog.com. There are also scenarios in which the plane may be too heavy, an air marshal needs to board or flight staff have to get to work. But in the case of the United flight, four crew members needed to board the United flight, operated by regional partner Republic Airlines, in order to work another flight in Louisville the following day or else that flight would be canceled, airline spokeswoman Maddie King said Monday. Experts agree that what United is dealing with is not par for the course. For one, the back-and-forth usually happens at the gate -- not once passengers board the plane. "This is pretty unusual, what happened," Hobica said. When a flight is overbooked, federal rules require that airlines first check to see if anyone will give up his or her seat voluntarily, according to the Department of Transportation. Airlines dictate what the compensation looks like, but it's usually a travel voucher toward a future flight or a gift card. These voluntary swaps occur "probably thousands of time every day on a national scale," said Robert Mann, the head of airline consulting firm R.W. Mann & Company. If airlines can't get passengers to switch of their own volition, they're allowed to bump fliers involuntarily. In 2015, 46,000 travelers were involuntarily bumped from flights, according to data from the Department of Transportation. Airlines set their own policies when it comes to the order in which passengers are bumped. The terms are sketched out in "contracts of carriage" that passengers agree to when they buy their tickets. On United flights, people with disabilities and unaccompanied minors should be the last to be kicked off, according to the company's carriage contract. American Airlines says it denies boarding based on order of check-in, but will also consider "severe hardships," ticket cost and status within the carrier's loyalty program. Delta Air Lines also takes check-in order and loyalty status into account, as well as which cabin a passenger is slated to sit in. The carrier also says it makes exceptions for people with disabilities, unaccompanied minors and members of the military. JetBlue Airways advertises that it does not overbook flights, but the airline still reserves the right in its contract. When airlines must involuntarily bump, there are rules to follow. Passengers must get to their final destination within one hour -- or carriers have to start coughing up money. If fliers get to their final destination one to two hours late (or one to four hours late if they're flying internationally), airlines are required to pay double the original one-way fare, with a $675 limit. If fliers get in more than two hours late (or four internationally), airlines have to pay 400% of the one-way fare, up to a $1,350 limit. Passengers have the right to insist on a check in lieu of a free flight or a voucher when they're kicked off a flight involuntary, according to the DOT. "Usually [airlines will] just up the compensation amount, and they'll find somebody at some price," Hobica said. United offered passengers up to $1,000 to de-board the Sunday flight, according to an internal e-mail from CEO Oscar Munoz.